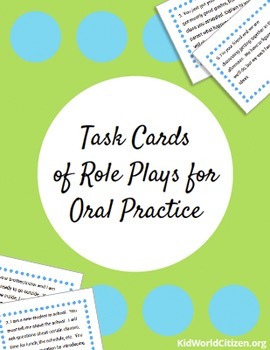 These fabulous task cards include role plays that teachers can use to increase oral communication in ANY language! The role play situations are written in English. 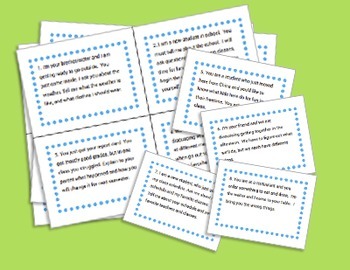 Students sit with partners, decide which role they will take, and then have a discussion according to the task card. Be certain that students understand that this is a two-way conversation, and that no one should dominate the conversation. You might want to review interrogative expressions, or even write them on the board before they begin. Insist that the students do the role play in the target language only. It is expected that students will make errors, but the important thing is that they keep speaking for as long as you are requiring them to sustain the conversation. Gradually, students will be able to sustain this activity for longer and longer. After completing one task (timing it for 2-5 minutes), you could have the students change partners and rotate task cards. Teachers might do two or three situations in one session. Task cards are numbered so students can record which role plays they've competed. 16 task cards are included. * 48 Beginner-Intermediate Spanish Conversation Starters! * 56 Intermediate-Advanced Spanish Conversation Starters! * Would You Rather..." Advanced Conversation Starters!